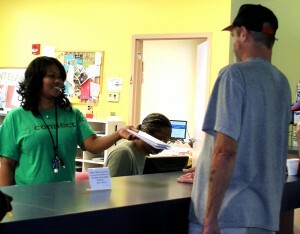 The Horizon House volunteer program has been dedicated to educating and engaging individuals to become life-long community advocates for the homeless. We believe that ending homelessness is a community effort. That is why we strive to provide a holistic approach to volunteerism that includes both service and learning. Help with organizing and serving food to the neighbors, as well as cleaning up the kitchen as needed. Interact with the neighbors by answering their questions as they work on the computers searching for jobs, applying for jobs, writing resumes, etc. Sort clothing and items upstairs in our donation center. Also helping to assist in making sure that donation center is clean and organized. 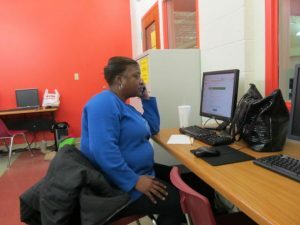 Assisting the Horizon House staff with the daily needs of the neighbors, clearing tables, sweeping, sorting mail, answering questions, retrieving needed items. Help with filing paperwork, addressing envelopes, entering data on computer, etc. Please contact Brenda at (317) 396-6369 or by email at BrendaR@horizonhouse.cc to set-up a tour and learn about volunteering.